First, did you notice anything different? Look up at the top...I have my own URL! Funny thing is we have owned that since I started blogging and just now (thanks to Joe) we got the name transfered to me! It's not really a big deal, but I like it! Ok, no, I'm so not ashamed of the gravy statement. I will admit I'm not much of a sauce person, but there are some sauces that are the main event for me. Gravy is that event! I made mushroom gravy for me! So, I thought a nice mushroom gravy would be perfect over it, oh, and it was! This was a major comfort meal for me. I want to have it over quinoa next time. It's kind of funny, the illustrator and I used to eat rice with gravy all the time when we first started dating (cheap eats people). I guess it holds a lot of memories for me now. Turns out the boys didn't mind my craving since they had a big plate of comfort food too. Sautee the mushrooms (I actually did this in a little water to help them along, but you can use dairy free butter or olive oil) until cooked. In a measuring cup, add the flour to the broth and mix well until the flour is completely dissolved. Gradually add the broth mixture to the mushrooms and stir well. Bring to a simmer on medium high heat stirring occasionally until thickened. Oatmeal is my all time favorite comfort food. What is yours? And just noticed you have the foodie blogroll widget. Dont remember if you were formerly with FB or not...but lmk how it goes for you! I got their emails but didnt act on it. Congrats on the URL! I also have a soft spot for gravy but never really eat the stuff anymore. I think I could get down with some mushroom gravy though. I love gravy too! And congrats on your URL! But now, I kind of like it and this looks unbelievable. YUM. Makes me wish I had a portobello. I always use tons of gravy when I have it. So good! 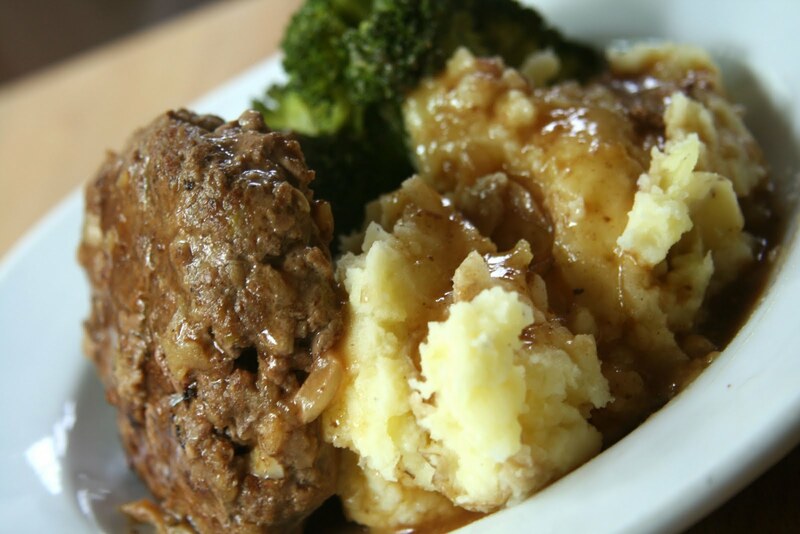 I love gravy too -- this would taste so good over a big baked potato. Delicious! I heart gravy. Especially with a strong savory flavor... just a little goes a long way! 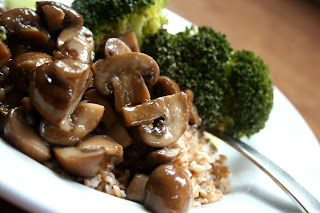 Mmmm...I'm a huge mushroom fan, so this gravy would be right up my alley! 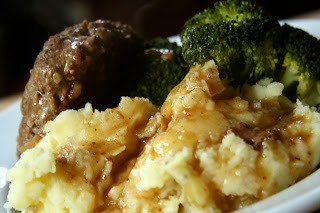 Gravy is one of those foods I didn't eat most of my life, then when I realized how good it is, I poured it on EVERYTHING! Gravy fries? Oh yeah. Thank you for the gluten free vegan recipe! I'm psyched to make this! I'm not a fan of gravy. I'm not sure why. I wish I was because that mushroom gravy looks fantastic! Look at you big timin' with your url. this would be awesome with baked GF chicken tenders. WOW! I bet your boys did eat that up fast! And I love gravy too! I had gravy on my mashed potatoes last night... yum! as much as i love the sound of mushroom gravy, i have never been a gravy person. How ironic is it that I mentioned salisbury steaks tonight, and here I come to your blog and see them?! ahaha, I think we are too alike :P Also - gravy? Yes, please!! I don't have it often enough, but you're making me seriously want some mushroom gravy...with bulgur. You're killin' me. Hope you guys are all staying out of the line of danger with all the storms blowing around down there! And congrats on the new URL! Mine is refried beans as weird as that sounds. I actually had some tonight. Congrats on the URL, hon! Congrats on your own domain! Yay! 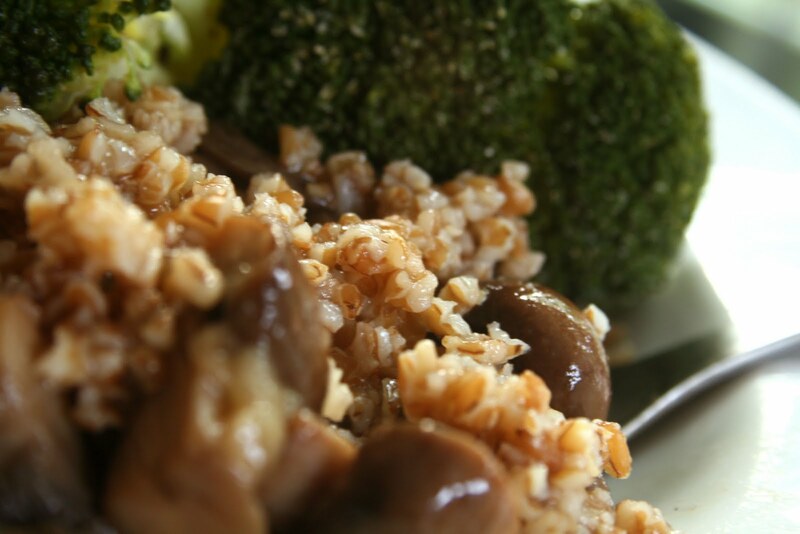 Mmm, mushroom gravy over bulgur sounds amazing! I just picked up some portobellos the other day...I see some gravy love happening this week! One of my ultimate comfort foods is a big stack of fluffy pancakes! But now that I think about it, pretty much any breakfast is fine by me! Gotta love a big bowl of oats or oatbran!